Hello! My name is Liyue Jin. Being born in the 80’s, I yearned for a good job, a good husband, a good family and a stable life. When I was 22, I was married and became a mom. The following year, my daughter was born. She had big eyes and a cute face. We hoped our daughter would have a warm, “fragrant” and delightful life ahead of her, so we named her Xinyi, meaning fragrant and delightful. Everybody said that my daughter was so cute and her name sounded very pretty. Her father and I love each other, but life was cruel. Financially, we had a difficult start. We needed money for baby formula, everyday needs and supporting our parents. My in-laws lived in the village of Tiemiao in a town called “Shihua.” We only had a little over one acre of farmland. A few years ago, a big flood brought tons of sand to our land. We didn’t have many sources of income. Eventually I couldn’t stay at home to care for my child. October 15, 2009, I went to work at a factory in Shanghai. My husband came a few months later and became an electrician at another company. I was making a very meager salary of $1120 yuan/month (approx. $175 USD). That year, I couldn’t go home to spend the New Year with my daughter. I missed her so much, but I could only hear her calling me “mom” on the phone. Every time I thought about her, I cried. In 2011, my husband went back home to spend the New Year. My factory didn’t give us permission to go home for the New Year and I couldn’t afford to go back, so I stayed behind and worked in Shanghai. During that year, I often cried holding my daughter’s picture. Xinyi grew taller and could walk already. Her grandparents said that she was very obedient and missed mommy very much. She wanted mommy to bring her a stuffed animal and she wanted to go to kindergarten like other kids. We knew we couldn’t afford it, but we kept telling her that when she was 4, we would send her to kindergarten. 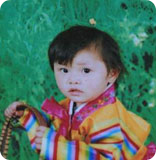 March 15, 2011, I received a disturbing phone call from home while working in the factory – my child had an accident! We rushed to 364 Aerospace Hospital in Xiangfan. We were frantic with grief seeing our child laying in the hospital bed. Her head, face, upper body, arms, and hands were covered with thick dressings. A Tube from respirator was connected into her throat. Her life was dangling on a thread. Her doctor told us that she had a level 3 burn and could die anytime. In the afternoon of March 15, Xinyi’s grandma went downstairs to go to the restroom. Xinyi accidentally touched an electric socket and triggered a fire. When her grandma heard her cry and ran upstairs, our daughter was completely covered in a blaze. When the fire on her was put out, she was almost dead. Her lungs were severely burnt. 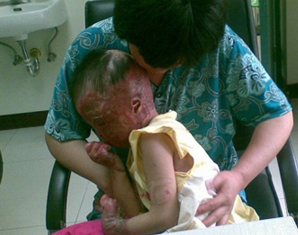 Because her clothes were flammable, Xinyi’s whole body caught on fire. Her head was swollen. Her face was charred. Her eyeballs were outside the sockets. Her left ear was charred and she was unconscious. March 17, my child stopped breathing. Her doctor revitalized her. March 21, a feeding tube was inserted. 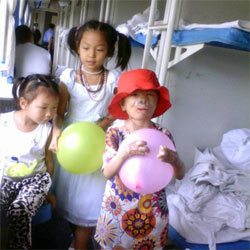 March 23, Xinyi had a skin graft surgery on her extremities. April 1, she had a skin graft on her face. 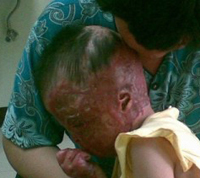 April 11, she had a skin graft on the back of her head. April 19, she had an amputation on several of her burnt fingers. April 28, my child stopped breathing twice. Now almost 4 years old, my child cannot eat normally. She can only drink some milk and eggs through her feeding tube. This can’t meet her nutritional needs. We needed to turn her every hour to prevent bedsores. My husband and I stayed at night and her grandparents stayed during the day. Xinyi’s life was finally saved. My cute girl was almost 4. She was smart, active and obedient. She was waiting for her mom to come home and see her. Now her cute and small face is no longer there; she was able to talk in broken sentences before, but now she can’t; her dad bought her favorite stuffed animal, but she can’t hold it anymore…Everybody in our family has been devastated. If we knew our child would suffer this much, we would’ve brought her to Shanghai. Maybe this disaster wouldn’t have happened. Maybe everything’s too late. I’m ashamed of myself. I wish I could take her place. Since Xinyi was injured, we have exhausted what we’ve saved from our meager income and have borrowed from everywhere to pay for her medical expenses. After 2 months, we’ve spent more than $100,000 yuan. Xinyi’s dad went back to Shanghai to continue working to pay for hospital bills. Xinyi’s injured areas have slowly recovered, but what we are facing is a cruel reality. Her face is deformed and her fingers are not complete. How is she going to go to school and care for herself? How does she fend off others’ discrimination? The surgery expense is astronomical for us. As long as my daughter’s heart is still beating, I can’t give up. Please help me and help my poor child so she can live a normal and healthy life and be able to go to kindergarten soon. After almost two years' of treatment in one of the hospitals in Beijing, China, Xinyi has gone back to her hometown around September 2013. She may continue the treatment in the future.